Provides a barrier against gas, moisture, and odor transmission to lock in fresh flavors. 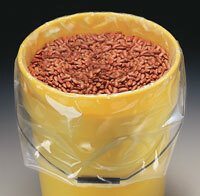 Made of polyester, PVDC, and polyethylene with strong, 3/8" wide seals on three sides. Not recommended for high-temperature cooking. Can be heat or vacuum sealed. Meets FDA and USDA specifications for food contact. Custom printable.